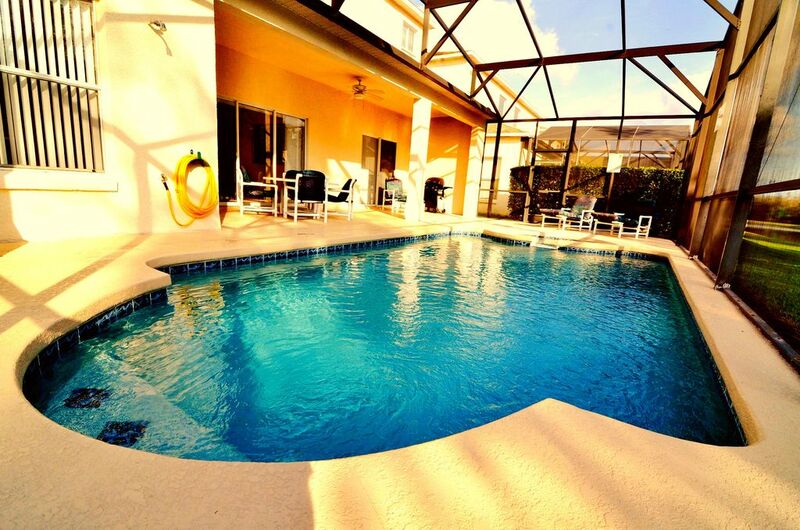 Our Kissimmee villa is close to everything, but provides a beautiful escape at the same time. The pool deck has a southern exposure and backs to green space. The house almost backs onto a pond, which includes a lighted fountain and walking path. 5 Full Bathrooms (three of the 5 are private baths for the three master bedrooms). Two full baths with hall entrances for the other three upstairs bedrooms. Sixth bath is a half bath downstairs. Views of two small lakes and conservation area from pool deck. New 18 cubic foot energy star with icemaker. Garage converted to Games Room with pool table, ping pong table and foosball table. Private pool faces green space for privacy. Pool heat available. Spa is part of the pool system.